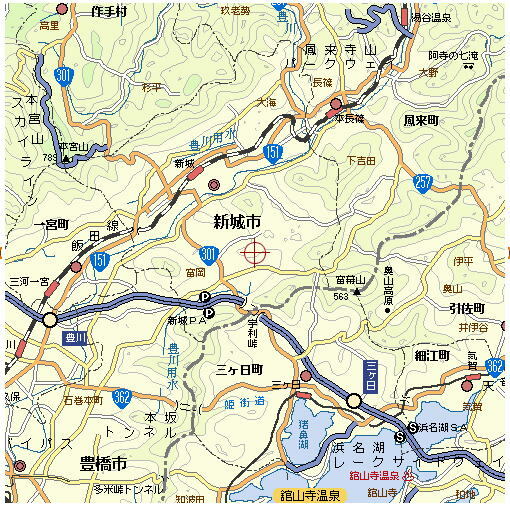 - Since the Fukaji Temple is located in a coutry side, it is best recommended that you drive here. Get on the TOMEI Highway and get off at the MIKKABI Interchange from east or the TOYOKAWA Interchange from west. From either intersection, Fukaji is in a 20 minute drive distance. - If you would like to use the public transportation from east, take the Shinkan-sen (bullet train) to the TOYOHASHI station, and then change to the JR local train to the TOYOKAWA station. If you are from west, come to Nagoya, and take a MEITETSU train to the TOYOKAWA-INARI station. Some visitors come as far as to the SHINSHRO station, but Fukaji is not so closer to the station. - We regret to tell you that no bus service system is available from the station to the temple. Take a taxi, or call the temple. We will possiblly pick you up (only if you are lucky.) Fukaji is staffed with two English-speakers. If you really need a lift, e-mail us in advance!